Granola is big in these little cakes, adding a variety of whole grains and nuts for a hearty texture. If you don’t have granola in the house, or would just rather avoid the extra sugar and calories associated with it, old-fashioned rolled or quick-cooking oats will work just fine. Preheat oven to 350°; coat a muffin pan with nonstick spray. Whisk flour, baking soda, cinnamon, and salt together in a small bowl. Mix both sugars, yogurt, oil, vanilla, and egg white together in a large bowl; stir in dry ingredients and granola until blended. Scoop 1/4 cup batter into each of 6 muffin cups and bake until a toothpick inserted in the center comes out clean, about 20 minutes. Cool cakes in the pan 5 minutes, then remove from pan and transfer to a rack to cool completely. Process cottage cheese, honey, and lemon juice in a mini food processor or blender until smooth. Spoon over 2 cakes. Wrap and freeze remainder. 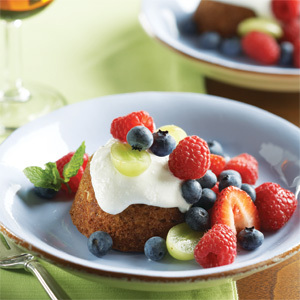 Serve cakes with fresh fruit. Add granola to the batter and stir just to combine. Overmixing makes cakes tough and chewy. Bake the cakes until a toothpick inserted in the center comes out clean. Do not overbake.